Sold! 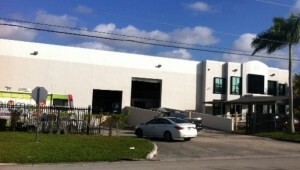 Class A, free-standing warehouse building located at 10855 NW 33rd Street in Beacon Industrial Park (BIP) in the City of Doral recently sold in December 2013 for a sales price of $1,625,000 or about $91 per sq. ft. The total size is 17,850 sq. ft. The properties features included dock height loading, with one drive-in ramp, partially air conditioned warehouse space and a mezzanine for extra storage. BIP also has great access to the Florida Turnpike and Dolphin Expressway. The Doral warehouse is within the Airport West Dade sub-market near Miami International Airport. The new owner will now use the property for their advertising services company. The ComReal Miami Warehouse Team represented the buyer, Natalie Baro with B&B Properties. Flagler Realty represented the seller, Alegra Holding (Alegra Motorsports). ComReal states that there are fewer free-standing warehouses for sale in the Doral area. The buyer did well to purchase this building since there are not any more of these being constructed due to the high construction costs as well as the bureaucracy. Alternatively, there are several spaces available for rent in a similar size range in the Doral area. For more information on this sale as well as other warehouses sold in Doral, please contact the ComReal Miami Industrial Team at 305-786-2380.